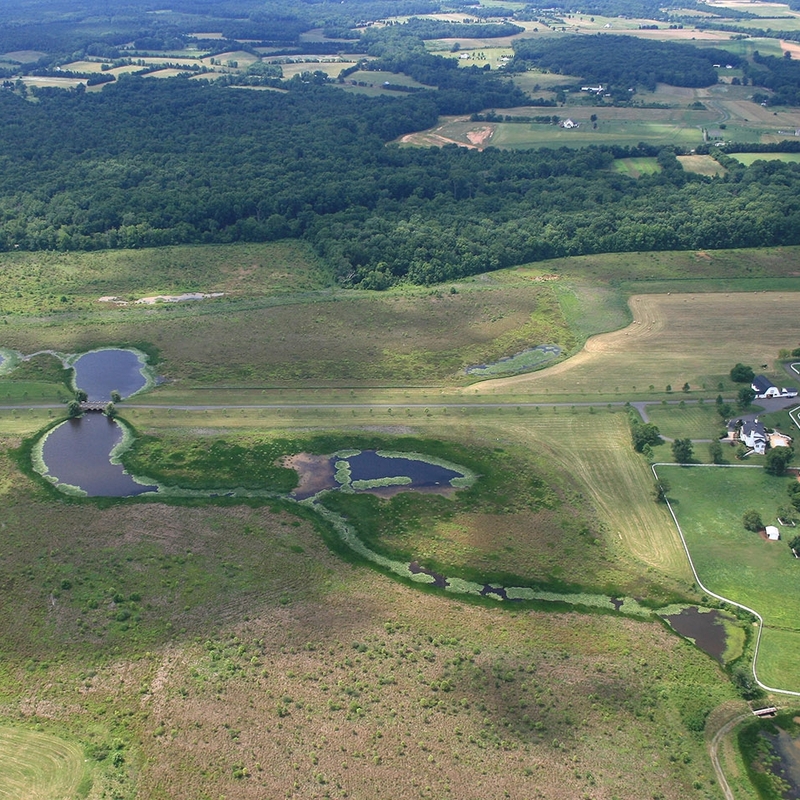 Mitigation Banking Services — Wetland Studies and Solutions, Inc.
Mitigation banking at WSSI has a long history that starts with Virginia’s first wetland mitigation bank and encompasses the first mitigation bank to sell stream credits. Our extensive firm experience and staff expertise allow WSSI to efficiently work through the mitigation banking approval process and establish bank sites that are thriving and successful. In addition, WSSI's mitigation banks provide economical mitigation solutions through expedited permitting and assumption of monitoring and performance standards. Using bank credits saves time and money; it expedites the permitting process and avoids the burden of monitoring and maintaining a project-specific compensation site. WSSI currently has wetland and stream credits available in the Middle Potomac watersheds; click here to see a map. If your project appears to be located on or just outside a service area, please contact us; our GIS department can overlay your project’s location onto the service area mapping to precisely determine coverage. If you want to retain credits, please submit a Mitigation Purchase Request Form. For streams in Virginia, the compensation requirement is determined using the Unified Stream Methodology (USM), which was also developed by Virginia Department of Environmental Quality (DEQ), in conjunction with COE. The USM uses a Stream Assessment Form to evaluate the quality of each stream impact on the project site (which is summarized by a Reach Condition Index value) and determine the Compensation Requirement (CR), or stream credits, required to offset that particular impact. Projects with multiple stream impacts simply add all the individual reach CR values to summarize the project’s total stream mitigation requirement. The USM manual and all its associated forms can be found at on DEQ's Mitigation webpage. Because one of our banks, the Northern Virginia Stream Restoration Bank (NVSRB), pre-dates the USM, we have stream credits available in a second currency – Stream Condition Units (SCUs). In some cases, the cost of mitigation requirement is less when using SCUs from the NVSRB, particularly for low quality streams with small drainage areas. To calculate the number of SCUs a project requires, simply enter the Reach Condition Index values obtained from the USM into our NVSRB Credit Estimation Form (click link to download form), along with the drainage area size of each stream impact. Any development activity that adversely affects wetlands or streams, often referred to collectively as aquatic resources, must be authorized in advance through a Clean Water Act Section 404 permit. Permit applicants must establish that the proposed impacts to aquatic resources are unavoidable; when impacts cannot be avoided, efforts have been made to minimize them by modifying development plans; and that compensation for the remaining unavoidable impacts is provided. It is in this last instance, compensation for unavoidable impacts, that mitigation banking comes into play. Per the Final Compensatory Mitigation Rule, mitigation banking is the preferred method of providing compensatory mitigation. Mitigation banking is a mechanism that funds the creation, restoration, enhancement, and preservation of large aquatic features (streams and wetlands) through the purchase of “credits” by development projects that have unavoidable impacts on their sites. Credits are the unit of currency in mitigation banking and are based upon the size, type, and function of mitigation. (For instance, wetland creation will create more credits than wetland preservation. Stream mitigation credits are based upon the pre- and post-restoration stream conditions.) Credits, as well as the required compensation ratio, are determined by the overseeing regulatory agencies, which typically includes the U.S. Army Corps of Engineers and Virginia Department of Environmental Quality. Each mitigation bank has a limited number of credits it can sell as compensation for specific impacts to aquatic resources. Once a bank sponsor proposes to establish and operate a mitigation bank, the regulatory agencies form an intra-agency review team (IRT). The IRT and bank sponsor develop, through consensus, an appropriate Mitigation Banking Instrument (MBI) that describes how credits are generated through creation, restoration, enhancement and/or preservation of wetlands and/or streams on a particular site. The MBI also governs the quantity of credits generated by the bank and the geographic area that a mitigation bank may sell credits within, referred to as a service area. When a permittee proposes to impact wetlands under Section 404 in the service area of the mitigation bank, and they have maximized both avoidance and minimization of aquatic resources, the authorizing agency may then allow the purchase of credits from the bank. The mitigation bank debits an amount of credits, prescribed by the authorizing agency, representing the loss of aquatic functions at the impact site. The bank sponsor may continue to sell credits to one or more permittees as long as sufficient credits are available at the mitigation bank under the terms of its MBI. The bank sponsor bears the sole responsibility for construction, monitoring, maintainenance, and setting up long-term protection of the mitigation bank. A portion of proceeds from each credit sale must be set aside into accounts to ensure funding of the initial ten year monitoring and maintenance period, as well as funding of long-term protection and maintenance beyond the initial ten years, independent of the bank sponsor. Mitigation banking creates larger, continuous tracts with greater biodiversity, higher ecological function, and increased sustainability than small, fragmented mitigation sites can offer. Banks also provide greater flexibility to project developers and engineers who lack the scientific expertise necessary to create and maintain functional wetlands on an individual site. Some environmentalists applaud the development of wetland banks because they allow the creation of high quality wetland habitats in a proper landscape position, with high levels of planning, regulatory supervision, and financial assurances. Additionally, they provide a greater likelihood of success because they are up and running before unavoidable wetland damage occurs on the impact site. Virginia Department of Environmental Quality - What is Mitigation? "Wetland Mitigation Banking" Chapter 7 in Applied Wetlands Science and Technology. 2nd edition. 2000. Chapter authors: Michael S. Rolband, Ann Redmond, and Tom Kelsch. "The Influence of Microtopography on Soil Nutrients in Created Mitigation Wetlands"
"Can the Mitigation Regulations Deliver Better Mitigation? Use Private Sector Models"